"Ask any Evo 4G user what they love about their phone, and eventually the word kickstand will come up. Having an easy way to hold the phone so it can be viewed is simply great, and is one of those things you wonder how you ever got along without. Fear not, non-kickstand enabled smartphones, the latest product from newPCgadgets.com called "Smartphone Coasters" has you covered. These sleek and attractive stainless steel stands compliments any setting to provide an easily accessible base for your phone. The Smartphone Coaster holds all Smartphone's; including the popular iPhone, Droid, Windows 7, BlackBerry and dozens more." That old adage about the simplest things being the best ideas? I think that applies here. 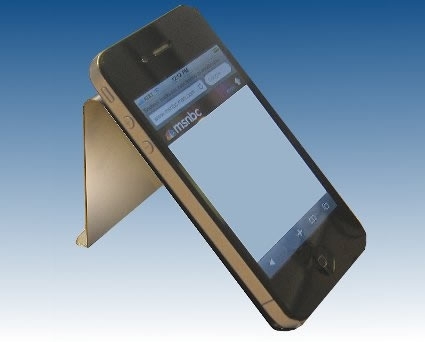 There's really not much to the product - it's a simple stainless steel stand, but if you're the kind of person that likes to have their phone/PDA/PMP/small tablet standing up at attention, this might be exactly what you're looking for. At only $3.99 per stand, and you can buy 'em in a six pack, they're affordable, functional, and a nice use of the "KISS" principle. The company also has some other clever products that you might be interested in. This is pretty slick, and simple, I may have to get a couple as cheap as they are!